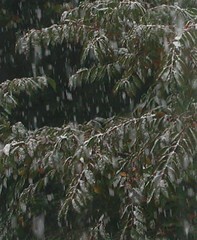 Yesterday we had an unexpected October snow that came down in big flakes. I liked the way the snow looked on the fall leaves, so I grabbed my digital camera and took a picture through the window. 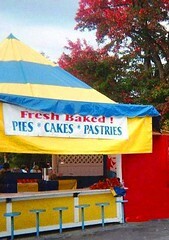 Then I cropped the image and enhanced the saturation a little to make up for color that got lost in the transaction. 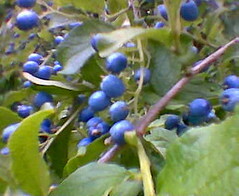 This are blue berries, not blueberries. 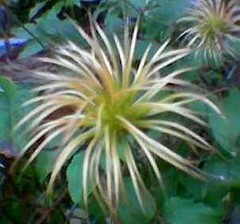 We saw these on a recent outing to Long Hill Gardens, and they are very mysterious. But I love the fact that they are blue. 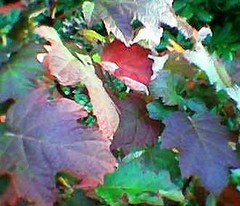 Everyone says this is not a very good year for fall color, very few red leaves, at least so far. 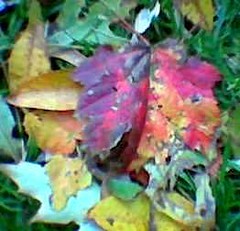 But on a recent walk, I spotted a beautiful bright leaf in the grass, so I took a picture with my phonecam, and later cropped it just a little bit to improve the composition. 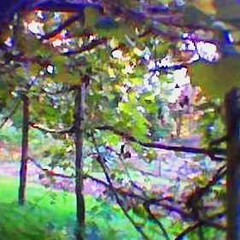 I took this picture with my phonecam at Russell's Orchard in Ipswich a few weeks ago. 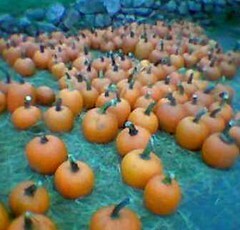 But this image came to mind today when I encountered pre-Halloween traffic lined up on highway 128. If you live anywhere near Salem (and we do), you can expect traffic problems all through October, and the closer it is to Halloween, the worse the traffic. Pretty scary. . . . 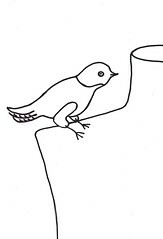 This is a little drawing of a mannekin (the bird) sitting on a mannequin. I drew this today with felt tip pen. It is intended as an illustration for a 'zine. Yesterday, I was at Logan Airport's Terminal C waiting for Mel's plane to arrive (it was late). 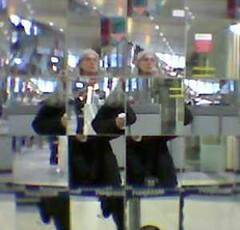 I decided to amuse myself by taking photos of the mirrored walls with my phonecam. I like this one the best, so I cropped it tonight to improve the composition. 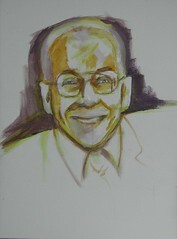 Here is the portrait I have been working on, as it looks today. This morning I worked on the eyes, modifying shape and size. I checked my work by looking at the painting in the mirror, which sometimes helps me see what needs to be changed. I also started to block in the figure and background. Today is the last day of Mel's trip to Northern Ireland, and he spent part of it in Bangor. 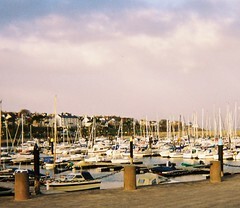 So today I cropped and edited this image from a photo that I took in Bangor during my first visit to Northern Ireland. Even in the cold weather, I could tell that it was a great place to visit. Time for another image of Portugal. 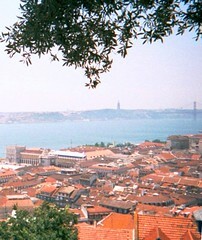 I took this picture during my visit to Portugal in July of 2001, from the Castelo de Sao Jorge in Lisbon. Tonight I edited this picture, cropping it to improve the composition. I took this picture with my cameraphone last week at Long Hill Gardens. I liked the way the leaves looked in the sunlight. It would be hard not to notice fall in Massachusetts! 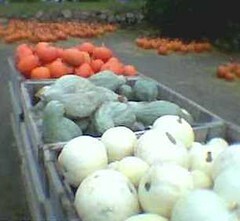 A few weeks ago, I took this photo with my phonecam on a trip to Russell's Orchard in Ipswich, Massachusetts. Tonight I cropped the photo to give the composition just a little help. After many rainy days, it was time for another trip to Long Hill Gardens. I have taken several pictures of the grapes produced by this arbor, but this time I photographed the arbor itself, with the sun streaming through the golden leaves. 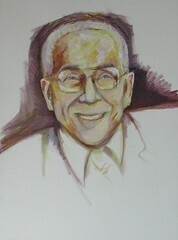 This is the latest version of the portrait I am painting. Today I made some changes to the eyebrows and hairline, and added some shadows. The changes are not huge, but small changes can make a difference in a portrait. Mel's in Belfast, so here's another image from my last trip to Northern Ireland. 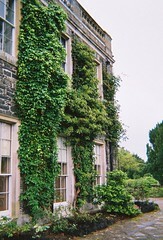 This is the Mount Stewart House, a manor house with magnificent gardens, just twenty minutes from Belfast. I have been admiring this tree right outside the bank, so recently I stopped to take a picture of it with my phonecam. 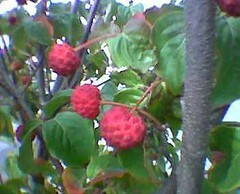 I love the color and the texture of the fruit. But I don't know what kind of tree this is, and no one else seems to know either. I suppose it is a wonder tree. . . .
Mel is spending ten days in Belfast, so I decided to post an image of Northern Ireland. 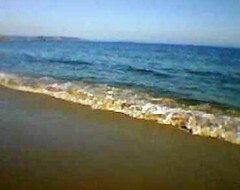 This is from my first visit there. 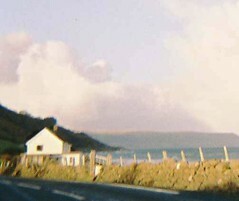 We drove up the Antrim Coast road, and spectacular views just kept coming, so I took pictures from a moving car with my disposable camera. Recently, I cropped this image out of one of those photos. After the image was cropped, I was happy with the composition but the image was too blurry, with color seeming to "bleed" outside the lines. So I opened the file in Painter IX and edited it to clean up some of the lines of the house. I left the rest of the image alone because the soft edges seem to work with the hills and clouds in the distance. Here's a nice memory of an October trip to Portugal. 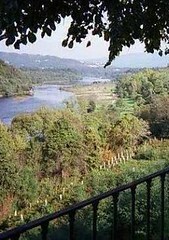 I took this photo of Spain (across the river) seen from Moncao, Portugal. 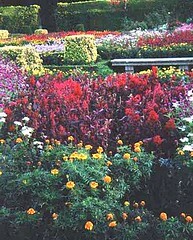 I used this photo as the source for one of the watercolors of Portugal that I posted last winter. Tonight I edited the original photo to emphasize the view of the distant landscape seen through the trees. 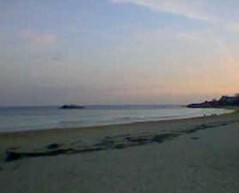 One evening last summer, I used my phonecam to catch this picture of Singing Beach just as the sun was going down. The beach seems to invite reflection on life, so I think this is a good image for the Jewish holiday that starts at sundown tonight. I love my digital clocks and computerized calendars, but it is also good to connect with the sun, moon, and stars as ways to tell time and mark the seasons. Despite the cold and rainy weather, there is still time for some fall flowers. 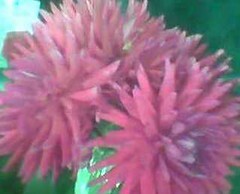 Flowers like these are blooming all over the neighborhood, but I took this picture with my phonecam at the Topsfield Fair flower show last week. Despite today's fall temperatures, we have recently had some good beach weather. Earlier this week, I used my phonecam to take pictures of the waves rolling in at Singing Beach in Manchester-by-the-Sea. Now that it is October, dogs are allowed on the beach again, so there were a lot of people walking their dogs. But a few people were swimming and tanning themselves, as if it were August instead of October. 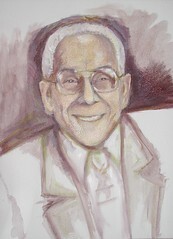 Here is the latest version of the portrait I am painting of my friend's father. I have made some changes, and expect to make quite a few more. I am still doing some basic blocking in of the features, adjusting proportions without worrying too much about detail at this point. The color of the face is more naturalistic because I added some middle tones. Right now, I feel like what I have is a general family resemblance, but it is not yet a likeness. I will keep going. . . .
One day this week, Heather and I went to the Topsfield Fair. 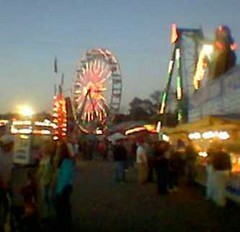 It was late in the day, but the advantage was getting to see all the rides at nightfall as the lights were turned on. I started taking pictures with my phonecam, and here is the one that I like the best. Warm afternoons and cool nights have been giving us heavy morning fog. So I grabbed my digital camera and went out to take pictures. I grew up in a very dry climate so I didn't see much fog as a kid. 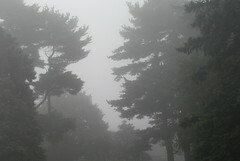 I always thought of fog as something out of a mystery book. Now I see fog more often, but it is still exciting to me and I love the way it makes things look, or rather, the way it makes us look at things. Fog makes us pay attention, just like art. 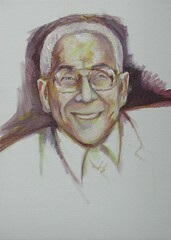 This is what I have done so far on the portrait of my friend's father. I used pencil to put in some light marks for placement, then switched to paint to start blocking things in. I start with yellow because it is the most forgiving if I make a mistake, and then go darker. I use brown or purple for darkest areas at first. I try to remember to put the background in as I go. At this point, I can see a resemblance but I can also already see things I need to change. Here's another picture from Portugal, from a group of photos that I loaded into the computer and edited earlier this week. My first trip to Portugal was around this time of year. Mauro showed me this beautiful garden in downtown Braga, where the flowers were still in bloom, although even in Portugal autumn was coming. In the fall, flowers seem brighter. Are they really brighter, or are we just paying more attention because we know we had better look at them while we can? The other day, I was thinking about making a card to send for the Jewish New Year. 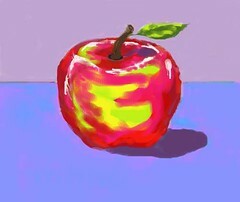 So I started to sketch on the computer, using Painter IX's digital chalk. It's just one apple, but they say you should start the New Year with something sweet, like apples and honey, in hopes of a good year. Even though it was chilly last night, it was surprisingly warm this afternoon, so Heather and I went to Long Hill Gardens with the dogs. I was surprised to see these roses still in bloom, in October! 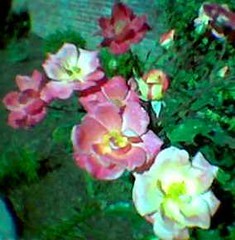 I liked the combination of yellows and pinks, so I took a picture with my phonecam. Tonight I cropped the image just a bit to focus on the blossoms. Today we were in Portsmouth, New Hampshire for breakfast (at Friendly Toast), and took a walk down to the water. 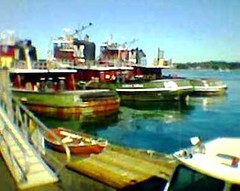 I used my phonecam to take this picture of the tugboats.